The Detroit & Toledo Shore Line Railroad began as an interurban passenger carrier and quickly evolved into a freight only railroad which was able to pay dividends consistently from its beginning in 1903 until its inclusion in the Grand Trunk Western in 1981. 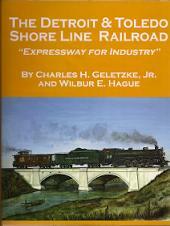 This book provides a history of the D&TSL and its operations. Starting with its years as an electric interurban, the book traces its rebirth as a steam railroad, freight operations, dieselization and the roads incorporation into the Grand Trunk Western. Also included is a look at the steam & diesel locomotives used by the line, freight cars, structures, on-line industries, Bridges and track maps. Many photos, some in color.